March 30, 2016: Exalting aggressive action, a feverish insomnia, the racer's stride, the mortal leap, the punch and the slap. come to the Calypso Invasion WFMU Meet-up. Oh. No cannibals allowed here, then? Wow right into it like an action movie that starts full throttle! My dad once took me on a non hunting trip. We didn't have any luck and he was so disappointed he would never take me again. Thanks to Laura Lindgren for today's playlist pic. But that's how hunting works. A lot of waiting. A lot of watching. Well, yes. Delayed gratification is probably its most salient feature. And for all those times when the hunt is unsuccessful, there are at least 101 non-flesh recipes at one's disposal. I stopped reading at "Nut Margarine." You're welcome, from me and Mrs. Blatch and the mighty New York Academy of Medicine--click on the picture and it'll take you to their blog--hey, there's a recipe for Snail Water! Eventually my dad took me to a non farm. It was nice to see the non frolicking in the field but I think that my dad felt even more inadequate at the memory of the failed hunt. Nice take on one of my favorite ABBA songs. Serve it to 'em "bleu." Not being familiar with the Non, can you mask the flavor if it is not appealing to you? Eww. Your meat burning preferences are so terribly wrong. Irwin likes it more noir than bleu! How does the Corpulent Britisher like his steak? Why order steak when what you want is shoe? Did Ertha do a Donovan cover album? In any case, no amount of cooking will save you from Bovine spongiform encephalopathy. So bon appétit ! I like my sushi on the rare side. Irwin, we can just sear one side of the non flank. Then we will serve the rare side up with the sushi presented thereon. Charred foods, especially meat, contain benzo(a)pyrene, which is highly carcinogenic. But the concentration is relatively low in foods cooked this way. So yes, charred food is carcinogenic, but when we're talking this level of concentration so are a lot of other things in everyday life. The smell of cooked bacon and new furniture (formaldehyde), for example. “Humans of New York” just put out a book… A COOKBOOK!!! 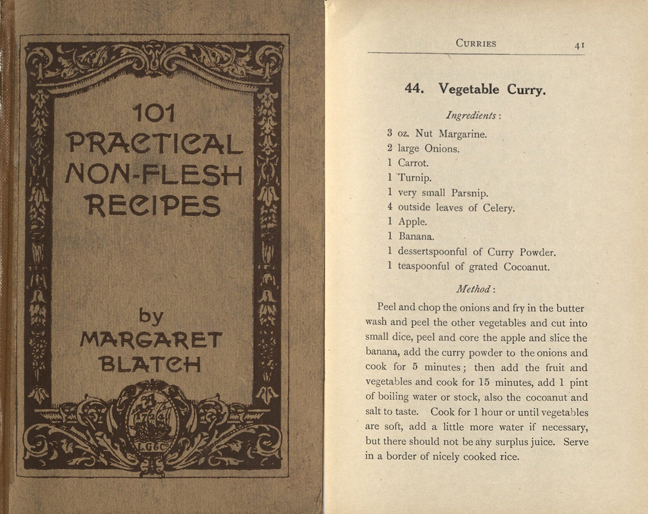 Blatch produced a sequel to "101 Practical..." entitled "Additional Non-Flesh Recipes," published in 1917.
is it like, the peoples cookbook? That's an impossible name, but I love it. Fay Lovsky, indeed. Fay is from the Netherlands. Popular over there. Irwin - You're at the Friday night screening of S&B right? Are you doing a q&a? Full DJ QA/Host sked here. At least one air personality appearing every night of the run. Or, as it was referred to in my family, Tender Was My Lesh. Daddy loves his Shjips. hi Irwin and nons. Wooden Shjips, The Fall, Beavis Frond, Earthless, Laddio Bolocko-some of my favorite new bands were first heard by me on WFMU. Irwin et al-Good afternoon! PEACE be unto all of you! Is a Bread Pilot a pilot made of bread or a bread made of pilots? Discuss. A Bread Pilot is a person licensed to navigate an airborne loaf. Contrast with an Unleavened Bread Pilot, a.k.a. a surfer. Do they offer a gluten free license? I might try that vegetable curry, but, having no nut margarine, will probably substitute chicken fat. I like southern Asian food. @Listener Robert-I would try it with used bacon fat. It browns stuff so nicely! Ike, I think a bread pilot is someone who flies bread. Or maybe someone who breads flies. He may look shabby and unkempt but I bet he'll smell great. AP: Jade East, babe. Vintage bottles. Three drummers listed for this 1971 session, don't know who's on this track but he's hammerin'. Yeah, I was just thinking that this sounded like real early-70s-fusion style drumming. Thanks for a great afternoon so far Irwin! No need to thank me, Marc. I just play what Brian Turner hands me. I say it's Stix Hooper. Just an uninformed guess. I called that 1-800 number and got a "not in service message." The old number wa 1-800-FREENOSEJOB.COM. I'm going to try that one now. Wish me luck. You look different today, Alison. I wonder if it's the free nose job I just got. Don't do the Baby-Nose! All the women here do the Baby-Nose and when they turn sideways, there's no profile! The 1800FNJ surgeons put it on top of your head? This band name makes me thing of a French confection made with nuts. Who said I want a refund. it works fine, it's still on my head. And now Irwin is playing the greatest pop group in existence. Everything is fine. It smells like the top of my head. So now I know what that smells like. Imagine ABBA produced by Dave Edmunds. if you are ever in Stockholm you MUST go the ABBA museum and get loaded at Garlic Shots. Abba reminds me of a confection w/ no nuts. "Jonly Bonly." Fans of Henry Cho, I presume? How should I pronounce their name? There are a number of options. since I heard Earth Kitt singing Donovan. You still pronounce it the same. You just take an audible drag from a cigarette beforehand. Used to be a Russian vodka bar in Denver--might still be there for all I know--that served [something]-infused vodka. I had one where the [something]=garlic. I can always rely on good counsel from the listeners. Garlic shots all around is clearly just what the ailing FMU staff needs. Oh, I'm sorry. Were you being facetious? Because I was. Any relation to Revolution ... Nov63? When I say I wasn't being sarcastic, I gotta admit I'm being a little sarcastic. There aren't knockouts in wrestling! Real wrestling, I mean. Maybe he's singing about chair-over-the-head wrestling. Good point, Dean. These lyrics needed a fact-checker. You know who should be singing wrestling songs? Where do the chairs come from, anyway? Are they hidden in their tights? Hell, the Beatles also sang "You Really Got a Hold on Me"! Q: Who's the greatest Poet in America? Not true. They recorded but declined to release an album under the name ABCDEFGHIJKLMNOPQRSTUVWXYZ. Maybe they would've had better luck using the decabet. I think if you knock out your opponent in wrestling they knock you out of competition. Imagine the girth of the booklet in the jewel case required to spell out the numerical name of a band Pi. I've heard that many musicians smoke those "jazz" cigarettes. Verbal pi, that's beautiful. It'd be LONGER than infinity! Jazz cigarettes is one of my favorite phrases. Surpassed only by oral pie. Aural pie is delicious... to the ears. Viper-Maid Cigarillos...ask for them by name! Was wondering about L&tHP a few days ago for reasons I don't recall. Something about their album being a collectible back in the '70s. @JP, ... and they are mild. Basically. Virtually. Essentially. Almost exactly. Better lyrics than the Strokes & worse Rawk. YO IRWIN......over and out from Oahu.....at High Noon......just reading the board today. Reminds me of Fred Lane. 'NorthAmerican' reminded me of Cake or Soul Coughing actually. Maybe they're the same. How could I tell? Viper-Made Cigarillos smooth even the roughest music. Try some,today! See what happens when you hit refresh, dear poster? Goo' na', all. Thanks, Irwin.